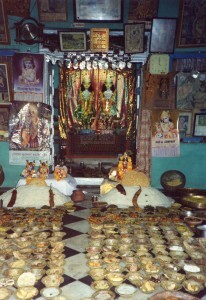 Annukut is celebrated by the Hindus as the fourth day of the Diwali festival, the day after the main Diwali day. It falls on the first day of the fortnight of the waxing moon, also known as Shukla Paksha, in the month of Kartik. This is a very special day for the devotees of Krishna, who celebrate it as the anniversary of the day Lord Krishna instituted the worship of Govardhan Hill. 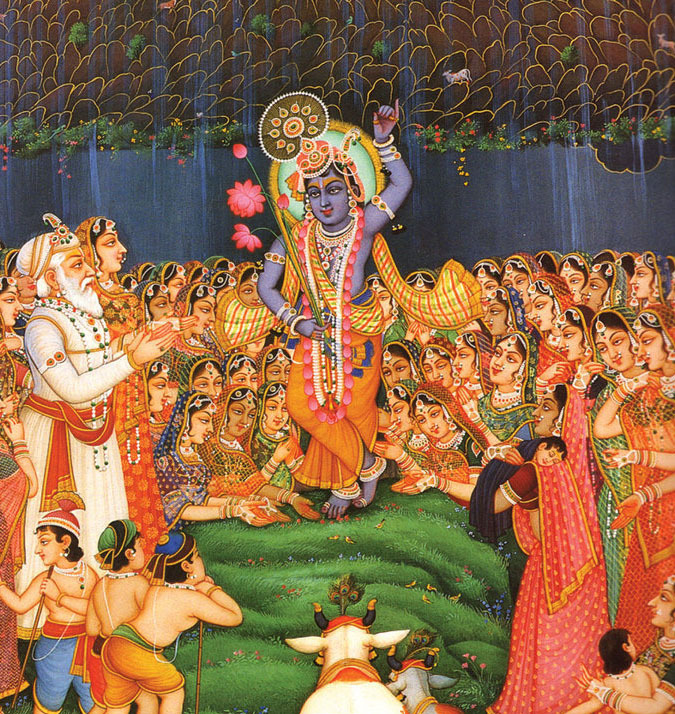 Instead of the traditional worship of Indra, the god of the elemental powers, Lord Krishna persuaded his father Nanda Maharaj to worship Govardhan. 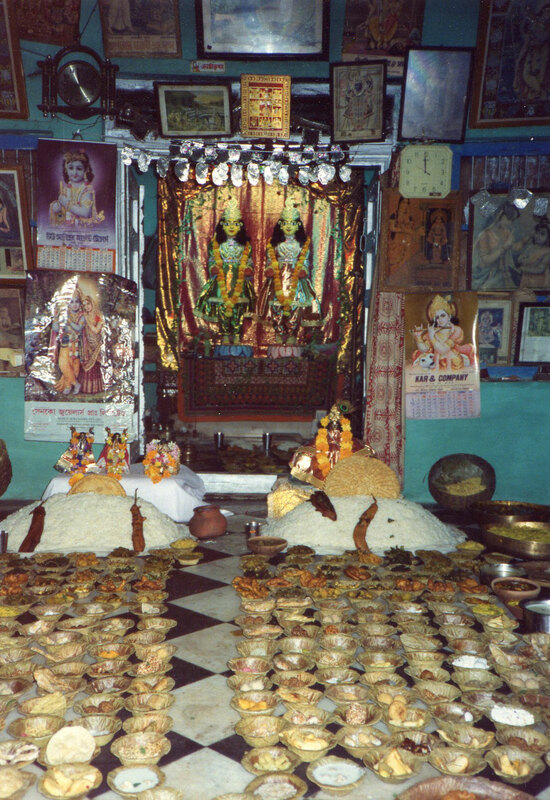 On this day the devotees offer Annukut (literally a mountain of foodstuffs) to the Lord and recall His pastimes of lifting the Hill to give shelter to the residents of Vrindavan from the floods sent by Indra to punish them for neglecting his worship. 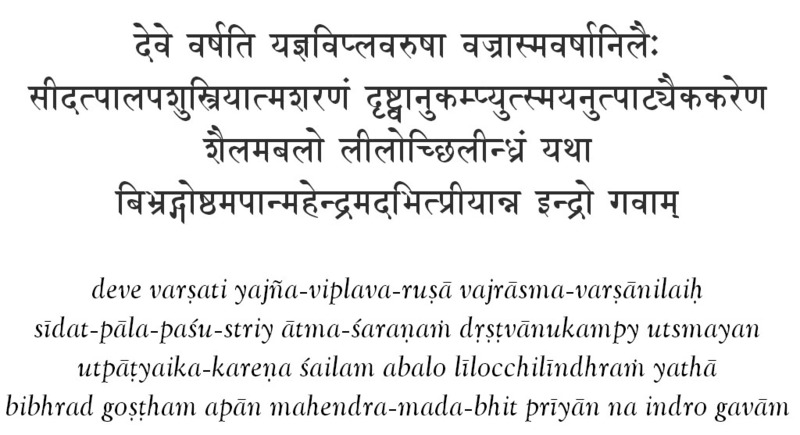 The very gist of the Govardhana lila, the very substance of the pastime, is represented in this verse. The milkmen in Vrndavana used to observe a sacrifice to satisfy the king of heaven, Indra, at whose command the rain, clouds, and other subtle elementary powers move. The main wealth of the cowherd men is the cow, and the cow’s main food is grass. Only rain can produce grass, and so the cowherd men used to perform sacrifice to satisfy the subtle power who is supposed to be in command of natural substances like rain. By satisfying Indra, favorable rains would come and there would be sufficient grass. The cows could then graze easily on the grass and generate milk profusely. The gopas, the cowherd men and their families, used to make different preparations from the milk, sell them in the marketplace, and in that way earn their livelihood. As the grazing ground in one place was finished, they would move from one forest to another. 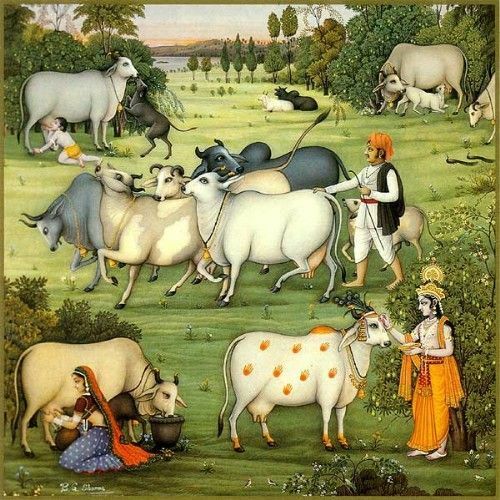 Only for the purpose of obtaining grass for the cows, Krishna’s father Nanda Maharaja and the cowherd men would wander from one place to the next. 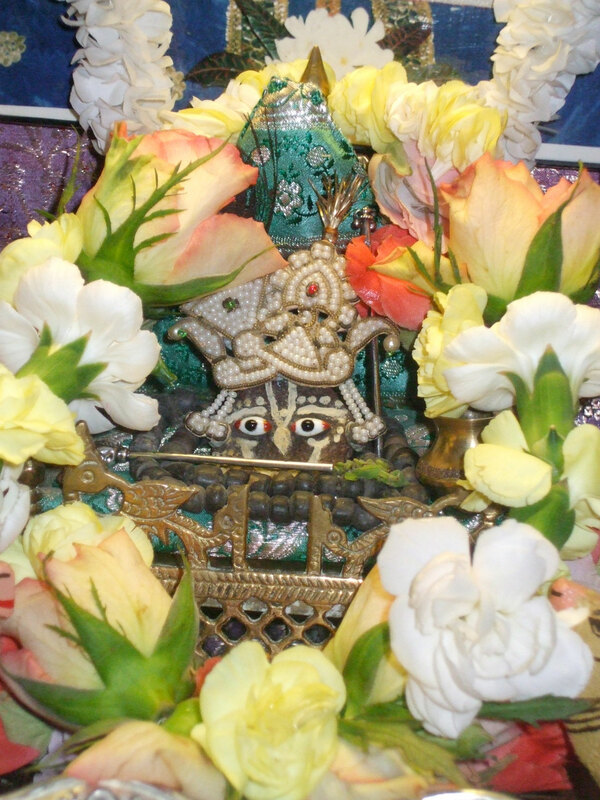 In this way, they lived sometimes in Vrndavana, sometimes in Nandagrama, and sometimes in Gokula. Once, Krishna wanted to assert Himself and modify the worship of Indra. 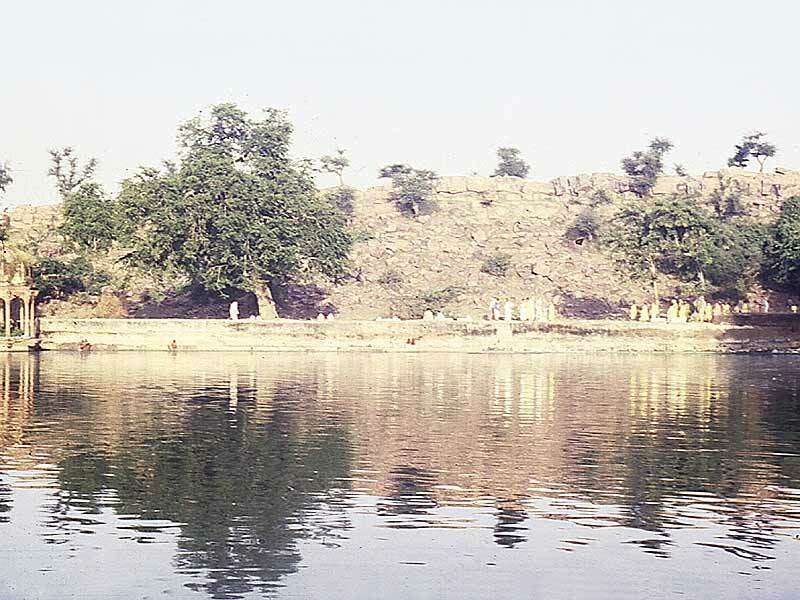 He wanted to establish His own domain, Vrndavana, in its pristine glory. Although He was only a boy, He was a boy of extraordinary capacity. He was only seven years old. But in the Padma Purana it is said that the development or growth of special personalities is one and a half times that of ordinary persons. Although Krishna was only seven years old by ordinary calculation, He was eleven according to general calculation. And so the gopas, the milkmen of Vrndavana, followed Krishna’s advice—some reluctantly and some willingly—and they began the sacrifice for Govardhana Hill. This news reached Indra, who thought to himself: “A boy of special capacity lives there. 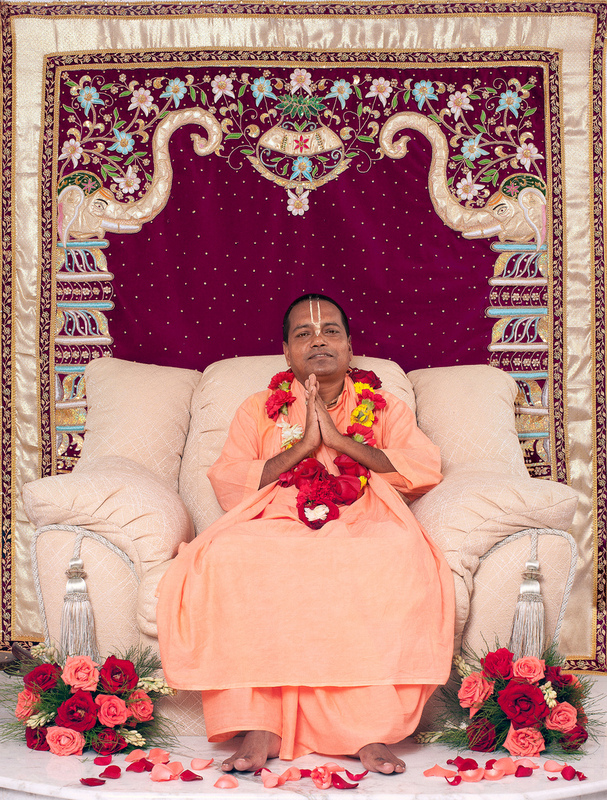 Now He has taken the leadership of Vrndavana and stopped this ancient sacrifice to me. 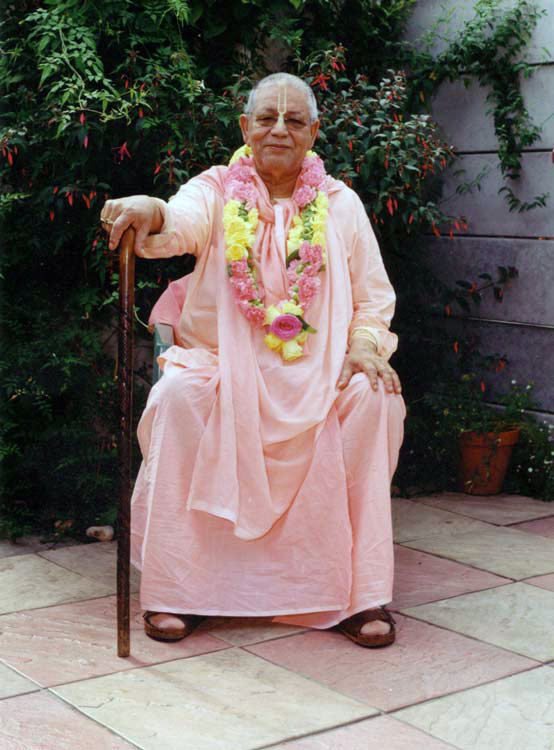 For a long time it was the tradition of the gopas to perform sacrifice to satisfy me, and now one boy is the cause of stopping my sacrifice!” He was very much enraged. Indra ordered the clouds and the wind and the lightning to attack the residents of Vrndavana. According to Vedic understanding, all the elements are personified. In ancient days, the Aryans and Rajarsis, elevated human beings and great sages, used to see everything as persons. They saw everything in a personal way. They thought of the creepers, the trees, and everything else in the environment as persons. They understood that they were all persons who, according to karma, are wandering through the different species of life. Once I was asked by a professor of biology about alternatives to Darwinian evolution. I advised him that evolution from consciousness to matter may be understood on the basis of Berkeley’s theory. Whatever we think of is really part of our consciousness. And consciousness means person. Everything that we may be conscious of is a person. We may think of the wind as an inanimate object, but it was thought of in the Vedic line as a person. Lightning, wind, clouds, and rain are all persons. Whatever we consider to be elementary matter, gross and subtle, were all considered by the ancient seers of the truth to be persons. Indra commanded the wind, the clouds, and the rain to go and devastate the whole area of Gokula Vrndavana. 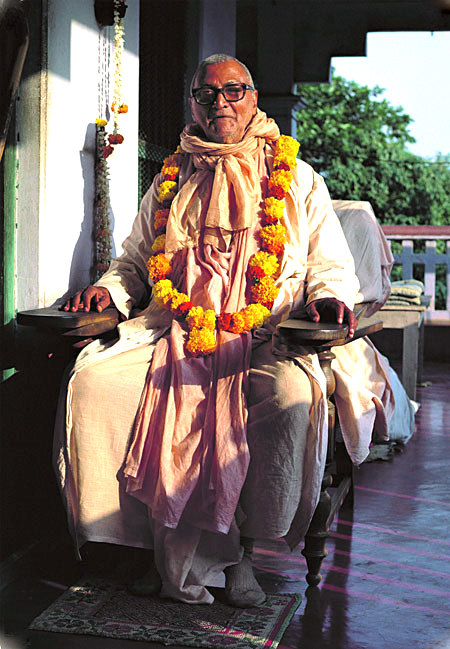 “The residents of Vrndavana have insulted me!” He said. “They have rejected me, have stopped worshiping me, and are instead worshiping that mountain, that hill of Govardhana. I can’t tolerate this insult! Go and devastate them.” By the order and wrath of Indra, the master of all the higher subtle elements, heavy rain began to fall. And so thunder, hail, and rain simultaneously attacked the whole of Vraja Mandala. At that time, with only one hand Krishna lifted up the Govardhana mountain. For Him, it was a very easy thing; with only one hand, He uprooted the hill and lifted it up as a child lifts a toy ball. And holding up that great mountain, Krishna gave protection to all those who were living in Gokula. The men, women, and children of Vrndavana brought the cows and all their worldly goods and took shelter beneath Govardhana Hill. The whole cowherd society was given shelter under that hill. In this way, by lifting Govardhana Hill, Krishna gave protection to the residents of Vrndavana, and crushed the pride of the lord of heaven, Indra himself. 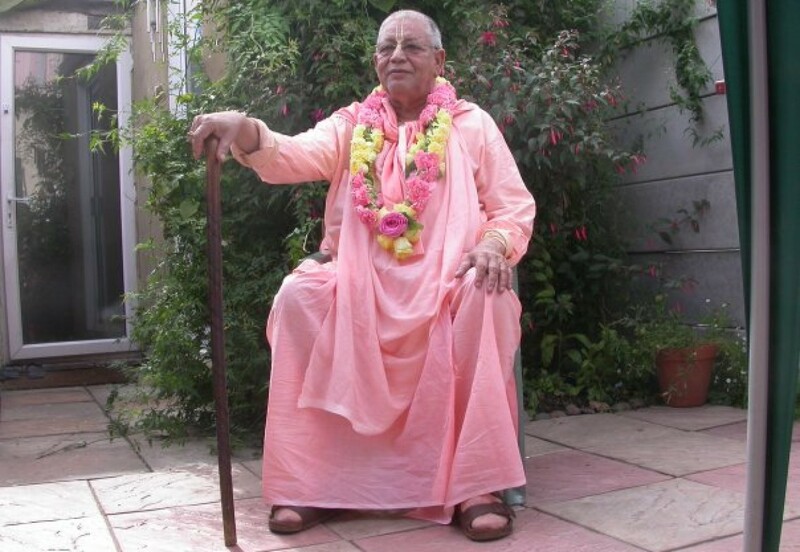 From this verse of Srimad-Bhagavatam, we can understand the position of the Lord’s pastime at Govardhana. It is also described here that when the Vrajavasis worshipped Him and engaged in sacrifice for His satisfaction, they saw Govardhana Hill as the Supreme Person, extending His hands, accepting the things offered to Him, and feeding Himself. At that time, Krishna pointed out, “You see! You thought that Govardhana Hill was only a heap of stone. No— it is living, it is the Supreme Personality of Godhead.” At that time, Krishna revealed Himself as Govardhana Hill and showed how it is also His extended self. According to authorities in our line, Radha-kunda is the extended self of Srimati Radharani and Govardhana is the extended self of Krishna. And so we worship a stone from Govardhana Hill, a part of Giridhari, as Krishna Himself. We may understand from this that a partof the infinite is infinite. And yet so feeble is our ordinary vision that although Govardhana-sila is a part of the infinite, and therefore also infinite, to our material vision it is only a piece of stone. This pastime shows that a thing may appear to be ordinary stone, but its possibility is infinite. In the general sense, Einstein’s theory of relativity has announced that anything we see is that thing plus something more. In his own scientific way he explains that the reality of a thing includes its possibilities, its prospect—reality is not at a standstill. Although many anomalies may try to catch us, Krishna will protect us. And in His representation as Govardhana Hill, that wonderful master of the cows will save us from all sorts of difficulties. How is this possible? God works wonders. His ways are unknown and inconceivable.